Acro yoga was never very appealing to me. I had played around with it here and there in the past with friends, but with no technique or guidance it never went far. I am so deeply in love with my asana yoga practice, that I never considered experimenting with acro, all that much… until I attended Little Birds, a beginners acro yoga series taught right here in Busan. The series is held monthly at Kaizen, and is taught by a good friend and fellow yoga teacher, Mindy Sisco. It has been about a year since I first dipped my toe in the sea that is acro, and during the past year I have been wading deeper and deeper into the experience. It can be said that acro is both very similar to hatha yoga and at the same time completely different. If you’re coming from a yoga background and try acro, then you will notice that a lot of the shapes and even the vocabulary are similar, Vishnu’s Couch and Parsarita’s Twist are two pose name examples. Also, strength and flexibility built-in a regular yoga practice will compliment acro immensely. How acro differs from yoga requires a longer description. Here are my personal lessons from acro. Trust – Falling onto someone’s legs, especially a stranger’s, and giving them all of your weight and yourself means that there must be a lot of trust between partners. There are drills to build trust that helped me to trust. In the beginning I was very untrusting, it was hard to give up the control, but with time and practice and learning of technique, I have grown to be open and comfortable to new bases and partners. It’s ok to Fall – Just as it’s ok to fall out of a balancing pose in a hatha class, it is ok to fall out of an acro sequence. Falling is part of the learning process. If you never try you will never succeed. You need to try new poses to test your limits and build the strength and flexibility needed to hold the pose later on down the road. That being said, I don’t recommend trying to mimic an advanced acro video off of youtube if you don’t have the basics down. Know your limits and be realistic. Importance of a Spotter – Acro is a two person activity, but should always be considered a three person activity in actuality, when you include a spot. The spotter has a highly important job of trying their best to make sure that neither participants break their noses or crack their teeth. As a yoga teacher, I have found that practicing spotting has mirrored my yoga teaching in that I have to be very aware of others’ bodies and I feel a real sense of responsibility in both. Spotting during some play time at the beach. Communication – I’m fairly certain that ESP has been mostly disproven, which is unfortunate, as it would be really useful in acro, instead we must resort to speech. After working with a partner for a long time and learning the sequences it would be possible to get in a flow and feel it out, but in the beginning you must declare what you’re feeling and what you need, to help each other out. Just Flow With It – Arguably my most important lesson from acro, is to let go of hesitations and worries and just flow with it. My day-to-day yoga practice can be rigid in terms of correct alignment; I sometimes play around with less traditional variations, but in general I tend to be a stickler for tradition. Attention to detail is primary in my practice – every joint must be in the right place, the gaze correct and strong. With that background, it was hard for me to just jump into an acro position, and I mean that quite literally – jump into a position! After some time and a little mental conversation with myself, I realized that it’s ok to do things less rigidly than I am used to. Had I not come to that realization, I never would have amazed myself with my acro abilities (if I do say so myself!) 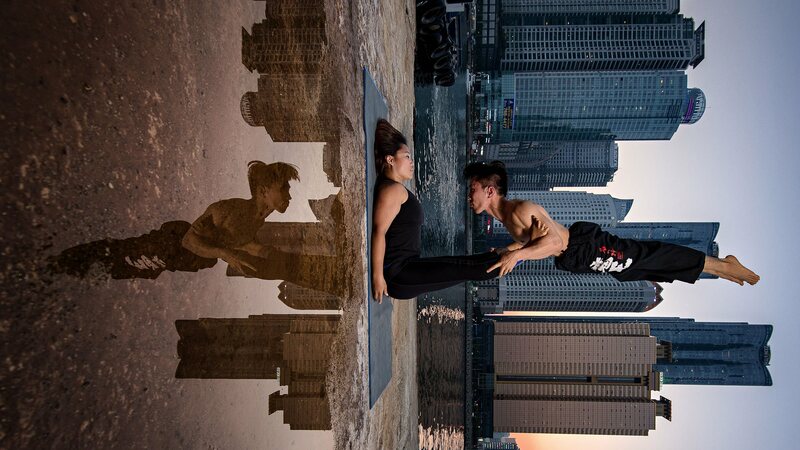 Similar to yoga, acro can be very empowering. My acro yoga practice has grown leaps and bounds (and flips and turns!) in a matter of months. It took an open mind and willingness to fall into another person, but with each session of practice and play, I began to feel more comfortable in my own skin and with others. I suggest seeking out an acro workshop or jam in your area if you haven’t tried it. It’s a great activiity to do with friends, a partner, or family – heck, it’s even fun to do with strangers. There’s a high likelihood that you will learn a lot, not only about acro, but also about yourself, and an even higher chance that you’ll laugh while learning. 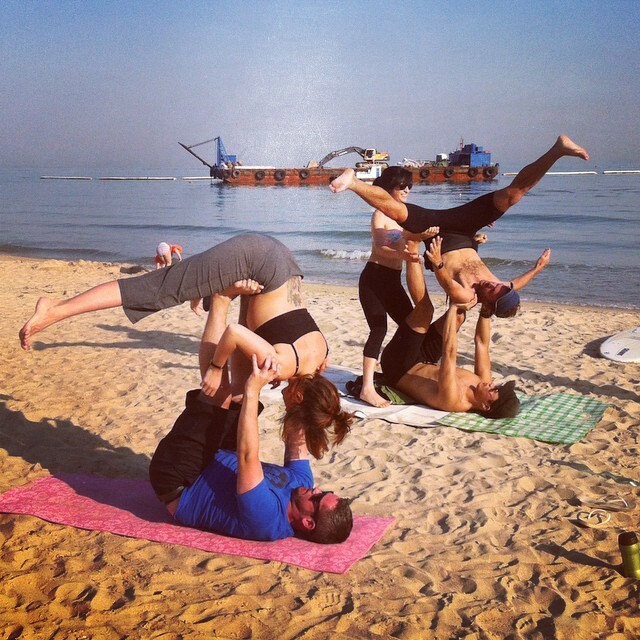 Information about acro sessions, classes, and workshops held at Kaizen in Busan can be found via their website at: http://www.kaizenkorea.com/ or on facebook via their page or the Busan Yoga & Meditation page.